Google likes to doodle, so it's fitting the Internet search engine with a penchant for artistic creativity would mark the 150th anniversary of Austrian painter Gustav Klimt's birth with a special rendering of its homepage. 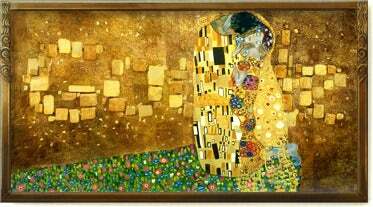 Saturday's doodle infuses Google's name in gold into a reproduction of "The Kiss," which is arguably Klimt's most famous piece of art. Klimt's paintings are some of the most expensive in the world. In 2006, Klimt's 1907 portrait of Adele Bloch-Bauer -- the "Mona Lisa" of Austria— sold for $135 million, eclipsing the then-record $104.1 million paid at auction for Picasso's 1905 "Boy With a Pipe (The Young Apprentice)." The Kiss, a square oil painting with gold leaf that depicts a couple embracing, is currently hanging in a Vienna palace museum. As for the artist himself, Klimt is known for co-founding the progressive Vienna Secession movement of the 1890s, although he fell out of favor with many influential people because of his paintings for the University of Vienna, which depicted scenes of turmoil. Later, Klimt surrounded himself with rich patrons who commissioned much of his work. The celebrated artist also is known for his romantic affairs and the many children he fathered, although his lifelong companion was fashion designer and businesswoman Emilie Flöge. 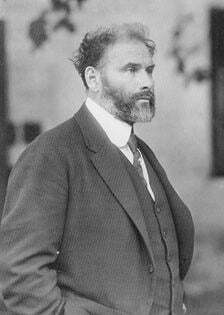 Want to know more about Klimt and what made him special enough to warrant a nod from Google? Head over to Google.com, click on the image of his famous painting, and you'll land at a search results page for "Gustav Klimt" where there is plenty of fodder for your artistic enlightenment. Over the years, Google has produced more than 1000 doodles. Some of them are simple, like the Klimt doodle, and others have been more interactive, such as the Web-based playable Moog synthesizer, which recently honored Robert Moog, a music pioneer responsible for the modern electronic synthesizer. That doodle let visitors to Google's main page play with the virtual synthesizer using the QWERTY keys of their keyboard and the arrow keys.